It’s not immediately obvious to anyone visiting Avoncroft museum in Worcestershire that in addition to being a museum dedicated to historic buildings, they also do a roaring trade in wedding receptions, with a hall and outside area dedicated to functions. It’s all really rather atmospheric! Disrupting the tranquil surroundings, Hard to Handle performed for James and Anna on a balmy Saturday night in August. The soon-to-be Mr. and Mrs. Owen actually chose us after looking at literally hundreds of bands on an agency website (though it’s always more cost effective to hire us direct). As happens quite often at wedding receptions, the wedding breakfast and speech timings over ran by more than an hour – it’s not always easy to predict how long it’s going to take 180 people to eat a three or four course dinner. But finally the room was turned around, which was our cue to start setting up our equipment. The acoustics of a room can be interesting – even though we have performed at Avoncroft museum previously, the same room can have a different sound from one night to the next, and it’s our job as professional museums to listen to the sound the room is giving us and tweak frequencies where needed to ensure that we are as clear and as crisp as possible. It’s important to us that guests can hear the vocals clearly and also that the instruments sitting underneath the vocals blend together really well – after all, there’s no point hiring a band if they’re too loud or if you can’t hear the vocalist, is there! Soon James and Anna were ready for their first dance, “You make my dreams come true” by Hall and Oates, a song that we have played before and absolutely love. It’s was great to see a bride and groom relaxed and enjoying their first dance, and this couple certainly enjoyed themselves. We also learned some requests in advance, including “Free falling” (Tom Petty), “Got my mind set on you” George Harrison, “The power of love” (Huey Lewis and the news), “Faith” (George Michael), and our own favourite, “Easy lover” (Phil Collins and Phil Bailey), which suites our two vocalist set up perfectly and totally rocked everyone present! When the audience are enjoying themselves this much, the night goes so quickly and before we knew it, we were playing the last song and hearing shouts of “encore” – which, because we are the hardest working function band in the UK, we obliged. Several times. James and Anna clearly made the right choice. 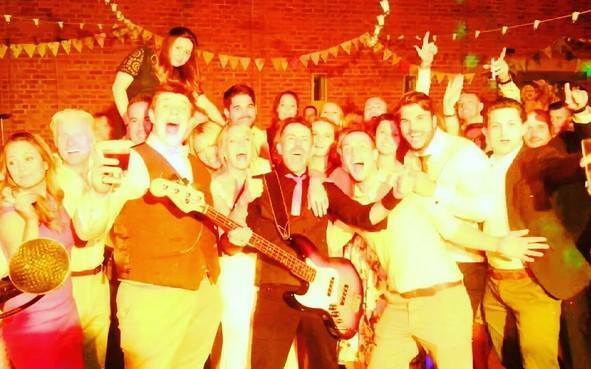 If you want to make the right choice when it comes to choosing your wedding, party or business function entertainment, call us direct on 0796 433 5657 and see what we can do for you! Difficult venue? Er, no, actually.